Hunting fishing camping hiking kayaking mountain climbing mountain biking rock climbing bouldering IDPA ASA and of course black smithing. I tend to forge my own wedges as of late I have moved to the round wedge design and I still forge it. I taper a 3/8" or 1/4" wide 3/16 thick piece all down the side then I determine how big of a diameter I want to use and I hot cut it there then I take a piece of round stock or a wooden dowel and I use it to bend the piece around to get the radius once a radius is formed I tighten the ends together then use a file to create teeth along the bottom of the wedge to help it grab the wood at this point it's ready to be pounded in. I prefer the round design of a wedge greatly over that of a straight piece. I can also get a 2" wide piece of 3/16" in the length if 6 meters and it costs me not a lot.after having them cut it in meter sections this allows me roughly 24 meters worth of steel to create my wedges. After reading everyone's posts about milling them and everything I feel like this would be greatly cost effective and works just as well I would even concierge selling these as four for a dollar that way I could still make a little after charcoal and steel cost then time invested. 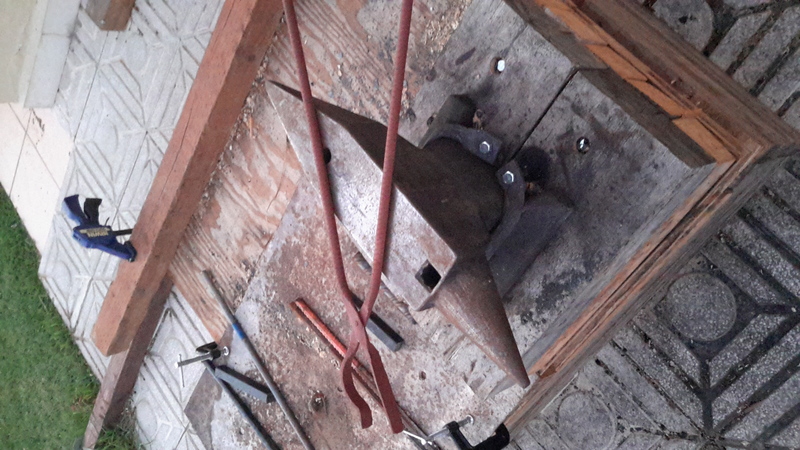 If I had a way to start doing handles in my current location I would sell hand make handles with wedge included also. 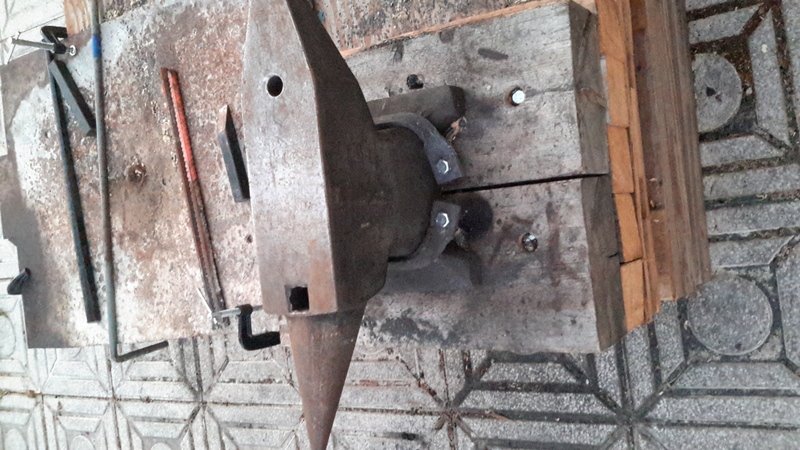 Here is a few pictures of my forge I recently have changed the connecter to the crank so it doesn't kink which gets me way more air flow. These forges have an adjustable baffle running through the bottom with holes you turn the baffle to open more holes. All the wood I use is 2x4s and 4x4s split in half gets hot enough to forge weld just fine and I can fit pieces all the way to 30"+ in it. 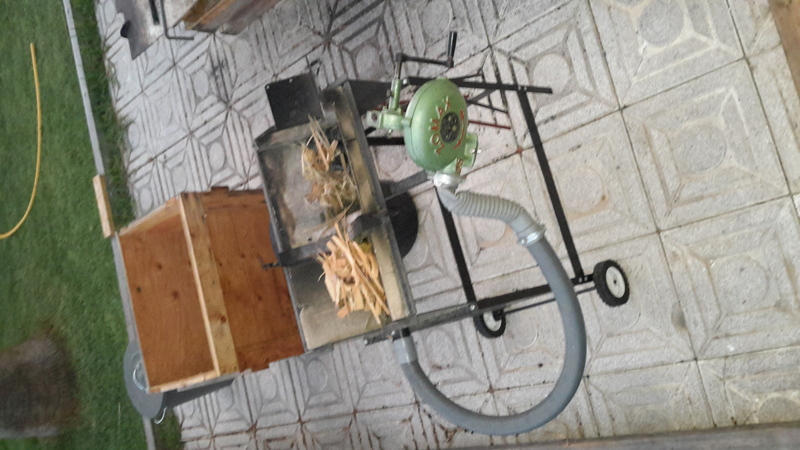 I also do not pre make charcoal at all I just use wood scraps. 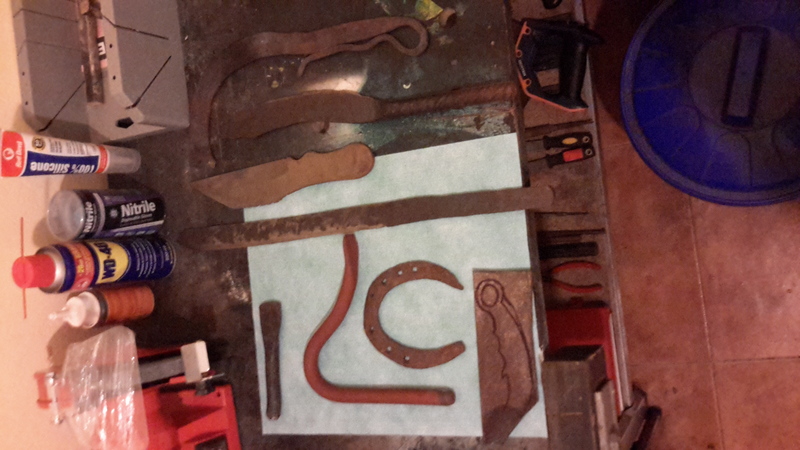 As a beginning knife maker tool maker and in general blacksmith I have had a ton of these questions for myself. All the guys at work want custom knives built for them. They all give me ideas of what they want then ask for a price I end up telling all of them that ilk make a knife to the idea they give me of they like it they can give me a price if they don't then we can go from there. These are all weapons guys and EOD guys some say make me a knife all I want is it to look cool others want to use them I tell them all the same name the price after I show you the knife and tell you the time I have into it. So far I've made a lot more money from my knives then I thought I would have. I do point out any imporfection in my knives after all these are my brothers and some of them carry them when we go out on missions so they are trusting me not only to do my job but my knives to also. Talk about responsibility. I've really enjoyed this post though because it does help put things in prospective for me. 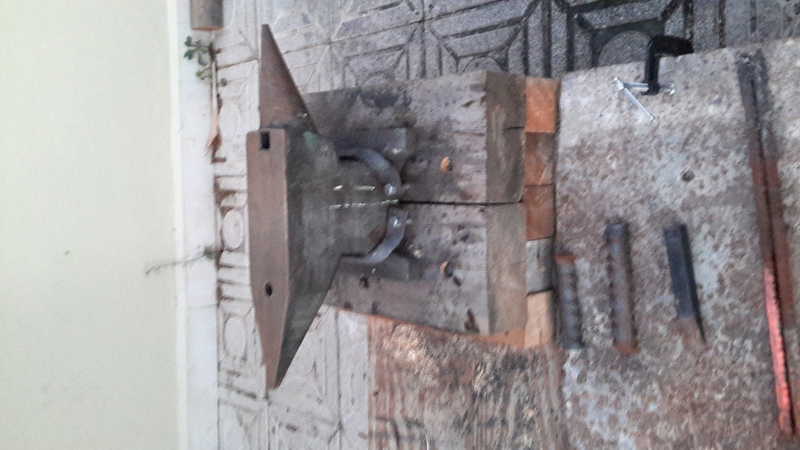 These are some pictures of my anvil and the base and stand I built for it. 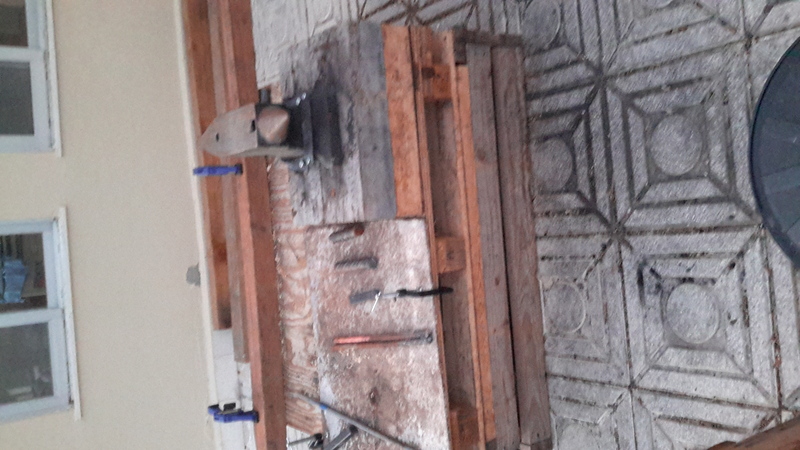 The 4×4s are bolted to the whole stand with 2 8" anchor bolts in each one then same with the 4×8s to the 4×4s then I took some steel I had, upset the middle a bunch just about tripling the thickness leaving about 1.5" at the ends the stock width and thickness then drew them out to the length I then twisted the end faces and forged them to fit the anvil snug up around the base above the feet. I then drifted holes to fit the anchor bolts through and anchord them to the base. It's solid as can be and works really well also when I leave spain to go back to the states I can just unbolt it and take it with me. 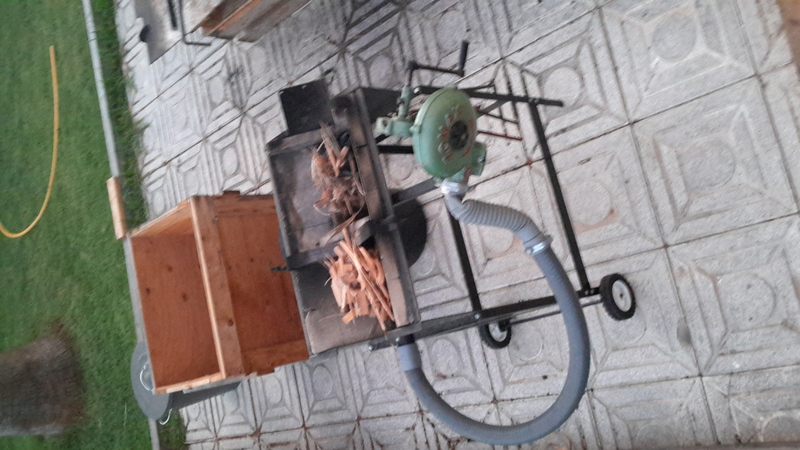 These are some pictures of my Whitlox wood fire forge which I use I got the hand blower because I don't like to be tied to society at all and don't want to ever have to rely on a power source. 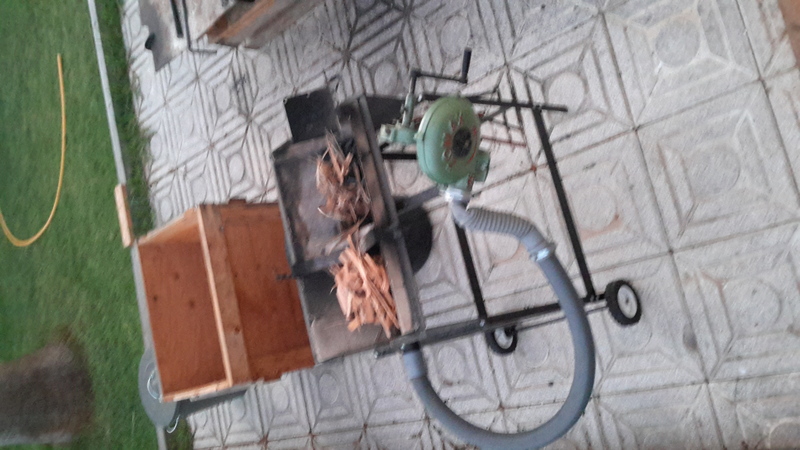 So far it has worked great gets really hot and relatively fast and is super efficient I can have a fire going for 4+ hours of forging and use less then a 10 gal trash can of wood chunks normally about half of one. Here is a couple shots of a pair of tongs I made I did a flat jaw design with a curved upper jaw so I can upset material to one side and still have room to grab it when heating the tip of the material and working it they also work well with flat stock and small round stock like making rivit from rebar that my wolf jaws couldn't hold. These are completely made from rebar the rivit and all. Some projects I've been doing. In the pictures you'll see my first hold fast I made that was an awesome project. A horseshoe attempt that I feel I did alright with. 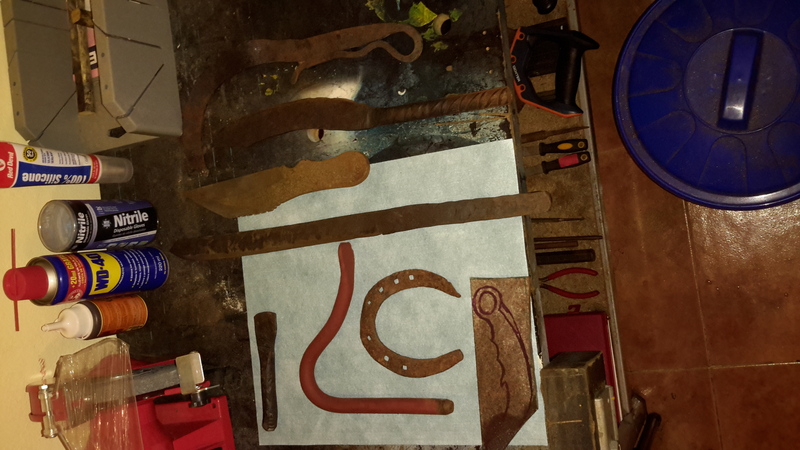 A few knives I've made out of rebar I found I could harden that I use in the garden a training karambit I'm still working out and a small hand wedge I made for cutting firewood since I only have a small hand saw and rounds tend to bind it us some. Thanks frosty I was just wondering because grease does keep brings from rusting and it's used to keep guns good for extended periods I also have used it by rubbing it into a rag then heating the rag up and wiping down splitting mals that seemed to keep all through the winter when wrapped in the rag. I don't have much options at the moment being new to a foreign country and not knowing any Spanish it's hard to find anything here let alone anyone who knows anything about smiting yet. So been away with work but got back kayaker 50 miles down a river to the coast and then built some new items for my forge. 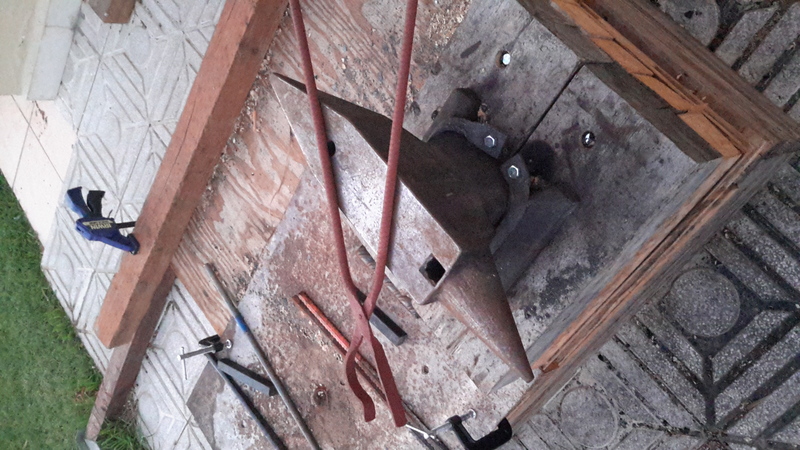 I created a hold fast from a bar we had at work that was about half inch round stock then I also made a pair of tongs drifted the whole and made a rivit from rebar also to put it all together. My next project is a hardy hole cutoff that I'm making from a huge 1.5 inch thick pry bar. After that I'll try to get some pictures up for everyone. Could a guy use say baring grease say for wheel hubs that's in a rag and wipe the face down with that after use to keep rust away? Just a thought and question also I'm in the process of building my smithy got about 3/4 the frame done but no walls or roof yet and the first rains started early this year. 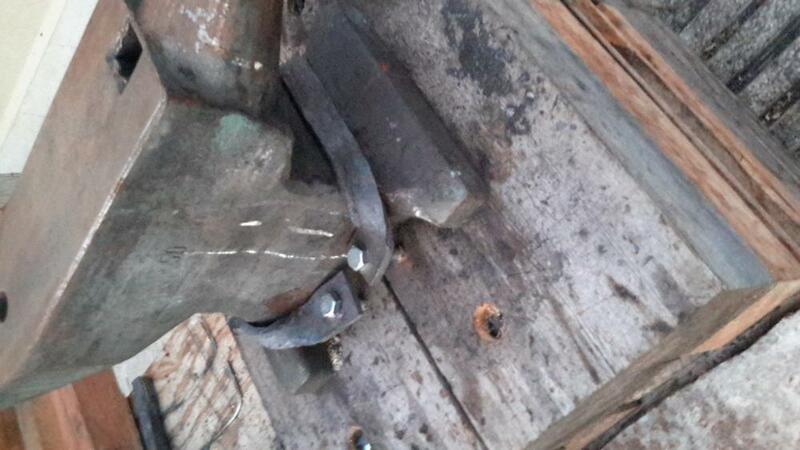 if you give me your mailing address/APO whatever, I can send you a piece of 4340 steel that is ideal for a hammer. Can you punch the eye?? Sorry for the late reply and that would be amazing I actually just did create a drift I could use to drift it for the handle. How much would it cost?